A warm Kinsale welcome to all players and supporters of the 30th Heineken Kinsale Rugby 7s this May Bank Holiday Weekend! Over 80 men and women's teams are competing in the Elite, Open and Social categories and there is a great calibre of players so plenty of competitive running rugby is expected. 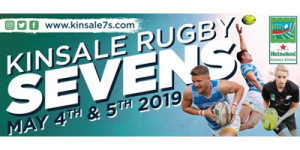 See www.kinsale7s.com for the schedule of events and fixtures on Saturday and Sunday.